I know this recipe isn’t particularly helpful to anyone else today, unless you’re looking to celebrate St. Patty’s Day six or seven days late. But despite my love of food blogging, I really can’t bring myself to pretend it’s natural to cook the food we all identify with a particular holiday a week before that holiday. Part of the reason I love cooking and eating so much is that food creates memories. The scent of a turkey fresh out of the oven conjures up the image of Thanksgiving amongst family, for instance – at different houses throughout the years, but with the same loving people, the same delicious side dishes, and the same sounds of football in the background. Every time I dig into some golden brown, cheesy scalloped potatoes, I think of my mom pulling the casserole out of the oven and the delicious garlic-y aroma that permeated the kitchen. Steamed clams remind me of the spicy sweet scent of fall leaves and playing tag or whiffle ball with my brother and the neighborhood boys before our yearly clam bakes with the neighbors. And corned beef and cabbage reminds me of putting on a sweater and watching the Patty’s Day parade in downtown Cleveland after ditching class with my friends from high school and swinging by the Irish American club for dinner, or my dad carefully pulling the brisket out of the large pot on their kitchen stove and then spooning liquid over my potatoes for me on St. Patrick’s day. It just seems like a betrayal of those delicious and wonderful food memories to make something five days in advance so I can score a few more hits off of a search engine, ya know? I was pleasantly surprised at how well this turned out. The flavors were spot on, and the brisket was tender and juicy. Plus, it doesn’t get much easier than throwing some meat and vegetables in a pot with water and spices and letting it simmer. Place water into a large stock pot with kosher salt, brown sugar, pickling salt, saltpeter, cinnamon, mustard seeds, ground mustard, whole black pepper corns, whole cloves, juniper berries, bay leaves, ginger, and ground mace. Cover over high heat until at a low boil, whisking occasionally. When salt and sugar have dissolved, remove from heat and add ice. Stir until ice is melted. Let cool, placing in refrigerator if necessary. The final temperature should be between 40-50º. Place brisket in the pot and submerge. Let sit in brine at least five days, checking occasionally to make sure the brisket is submerged (a heavy pan or plate may be necessary to accomplish this) and flip 2-3 times. After at least five days, remove brisket from brine and rinse under cool water. Place brisket into a pot just large enough to hold the meat. Bring to a boil over high heat. Reduce the heat to low and simmer, covered, for roughly 2 1/2 hours. Add potatoes after 2 1/2 hours. Once slightly tender or about 10-15 minutes, add carrots. After another 10-15 minutes, add onions and cabbage. Boil 15-20 minutes until cabbage and onions and tender. 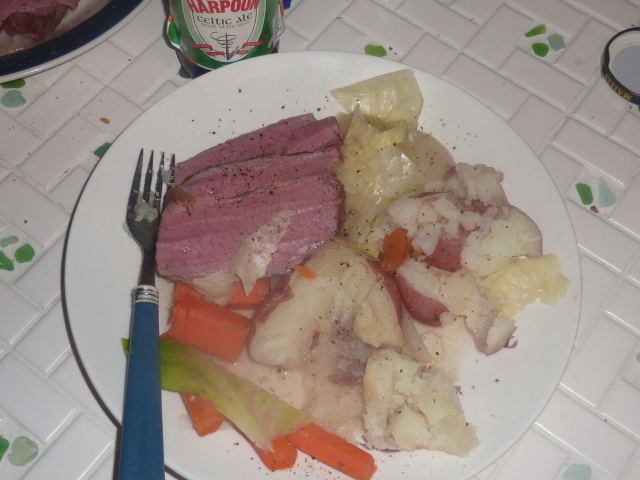 Remove the corned beef from the pot and let rest 10-15 minutes (this can be done before adding the cabbage). Cut against the grain. Serve with cabbage, potatoes, carrots and onions, some juice from the boiling liquid, hot horseradish, and/or whole grain mustard.